It is also known as also known as the mammatocumulus meaning mammary cloud. These cloud formation usually was seen after the thunderstorm has been passed. It is like a pattern of pouches hanging underneath the base of a cloud which looks beautiful. The cloud formation looks beautiful when sunlight is reflected through them. 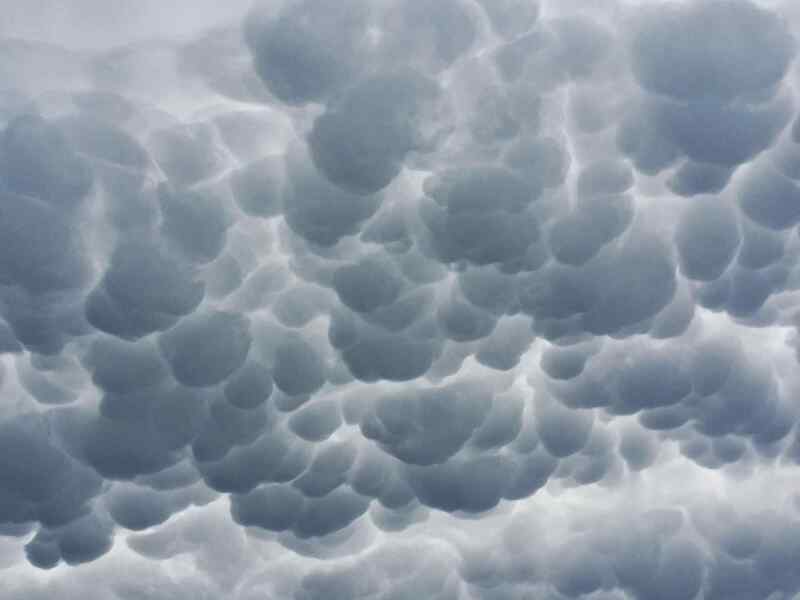 These formations are one of the long-lived if the sinking air contains large drops and snow crystals because the larger parts of clouds will require greater amounts of energy for evaporation and over the time droplets of clouds will evaporate and certainly the mammatus clouds will disappear. The formation looks like pouch-like cloud structures and one of the finest examples of clouds in sinking air. According to studies, the clouds are ominous in appearance because they are harmless and does not have any relation with the tornados. A Shelf cloud is a low and horizontal shaped cloud. They are usually seen after the thunderstorm or the cold front. Most false tornado and false funnel cloud reports are associated with shelf clouds. There is only one difference between the self-cloud and roll cloud is that the shelf cloud is directly attached to the parent cloud. Talking about the appearance, the edge of the shelf clouds are smooth, However, at times they are layered or terraced. You will experience it as a leading edge of an approaching line of thunderstorms with straight winds as it passes through overhead. Tornadoes rarely occur with the shelf cloud. This cloud formation is very rare to watch as they disappear very quickly. The main reason for the formation of these clouds is the velocity difference across the interface between two fluids. This form of instability has been studied by Lord Kelvin and Hermann von Helmholtz and thus the name of the cloud formation is given. The cloud formation looks like breaking ocean waves and rolling patterns can be seen at the top of the clouds and can be easily seen with the naked eyes. The formation mostly was seen on windy days or when there is a difference in the density of the air i.e temperature inversion. Researchers take this formation as an indication of atmospheric instability and the presence of turbulence for aircraft. These cloud formations are also very rare and last understood cloud formation that exists in our earth atmosphere. These are also highest cloud formation and usually formed 80 km in the sky. They are usually visible in twilight and it also depends on many factors. The clouds are made up of water ice. Talking about the appearance, the cloud formation is silvery or bluish white and mostly seen on summer nights that too at hgh atitudes. The formation consists of ice crystals and dust from meteor smoke. The ice crystals form because the higher level is the coldest and the wavy pattern indicates the existence of strong winds at that altitude. They are also called jellyfish clouds because of their appearance as you can see in below picture. They are usually formed when the rush of moist air comes from the Gulf Stream and gets trapped between layers of dry air. The cloud formation occurs in the form of billows, rolls, heaps or even pancakes. The colour is usually white or grey in color with a shadowy appearnce or in the form of waves. The formation is well shaped because of high winds at that level, however, they became partly fibrous and diffuse. The clouds does not indicate rain, however, they might indicate a weather change within a day or two. These cloud formations are of smoke and condensed water vapour. These are the results of a very large explosion like a nuclear explosion and volcanic eruption also any sort of large explosion can result in the formation of these clouds. The reason for the formation of this cloud is when hot low density gaseous near the ground creates Rayleigh-Taylor instability. The fire of the mushroom clouds spreads in all directions and a convection current from inside the head. These currents put a force on the edges of the head to move downwards and again join the central column giving it an appearance of mushroom and hence the name. There can be two conditions that result into formation of Mushroom clouds either by a manmade or natural explosion like a volcanic eruption, however, sometimes they have been seen in small explosions also like firing of a cannon. They are also known as altocumulus standing lenticularis. These clouds are also very rare to watch. They have an appearance of stationary lens-shaped clouds and are usually formed at very higher altitudes. They usually are at 90 degrees to the direction of the wind direction. The reason for the formation of these clouds is the moist air when flows through the mountains resulting in the formation of waves on the downwind side and some of them take the form of the wave cloud. The clouds can be dangerous for pilots of large planes who generally avoid flying over these because of turbulence above them. The cloud formation is often confused with a UFO. They are also usually seen after the thunderstorm and cold fronts. These are also formed of arcus cloud. These cloud formations are also because of microburst activity. These cloud formations are very low and tube-shaped. The cloud formation often appears to be rolling slowly along its horizontal axis, however, Roll clouds are not and do not produce tornadoes. Talking about the appearance, it is a tube-shaped low-level horizontal cloud formation isolated its base. These cloud formations are usually classified in large dark and rounded masses. The formations are usually occurring in groups, lines, and waves. They also formed at a lower altitude. The reason for the cloud formation is the weak convective currents that create shallow layers because of the above stable air. The low-level cloud formation usually forms in the lowest two kilometres of the atmosphere and appear in the form of grey to white low clouds or regular clumps or patches arranged in the form of bands or rolls that lie across the wind. The cloud formation can cover the entire sky, however, patches blue sky can be seen in the middle. These cloud formations are also known as fallstreak hole. They are usually seen with UFO sightings. The reason for the cloud formation is when the water temperature in the clouds is below freezing but the water hasn’t frozen yet. Additionally known as Hole Punch Clouds or Fallstreak Holes and are considered as a strange hole in the cloud layer. These cloud formations are normally circular, however, it can be oblong or even pentagram in shape. The formation will start with a clear hole in the clouds and later fill up with the clouds. These are the 10 different types of clouds formations and their meanings. Do post your comments.